Why hire professional sewer inspection and repair contractors in Los Angeles? For any business or residential property situated in and around Los Angeles, sewer lines happen to be a crucial part of its wastewater removal system. Thus, any problems associated with the Los Angeles sewer lines are not to be taken lightly. As unattended sewer lines problems will lead to a lot of issues including property damage. 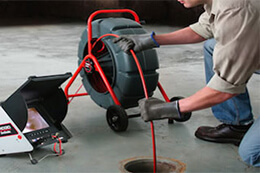 Any kind of sewer line repair work require the attention of licensed professional plumbers. Only an expert sewer inspection and repair Los Angeles professional will be able to locate, detect and resolve the problem at hand accurately and quickly. Sewer line repair Los Angeles services are needed for problems like sewer line backups, slow removal of the wastewater, pipes breaking or crushing, gurgling, leaks, clogs and such others. These problems can be caused by a number of reasons like scale or sediment buildup, tree root infiltration, lateral line problems and such others.As the sewer lines are located underneath the establishment, hence without the right knowledge and tools it is impossible to pinpoint and/or locate the reason behind the sewer line problem. But a qualified sewer line inspection Los Angeles contractor/service provider has the experience, training and all the latest tools and equipment to successfully get to the root of the problem and fix it accordingly. First mapping of the problematic plumbing system will be conducted by the professional; followed by identification and inspection of the problem at hand. After that the drains will be isolated and drained for a proper Los Angeles sewer cleaning. After drying with compressed air, the epoxy lining process will be conducted by the professional. After the epoxy lining, the plumbing system will be refitted to make it ready for different tests. The tests are conducted to make sure that the system is working properly. Lastly, sewer camera inspection will be conducted. The process will differ from one contractor to another. Nevertheless, this very process does come with the same advantage that is no tearing or damaging of the property during the Los Angeles sewer repair work. Here it is important to mention that this very process performed by different sewer repair Los Angeles professionals comes with other advantages too. Many times, the problem may seem like a big one, but regular cleaning or replacing of a damaged/old or faulty part can fix the problem at hand. Thus, this process will help the professional to realize that the current problem is not serious at all. So, in such a case, the professional will provide normal/simple sewer replacement Los Angeles or sewer cleaning Los Angeles services to fix the sewer lines. Hence, it is also safe to say that this process also comes with the advantage of cost saving. Sewer pipes are the major part of the plumbing system in residential or commercial properties in Los Angeles areas. Drain pipes exiting the building portion is called Sewer Line or Sewer Pipeline. Many residential properties have minimum 3 inch up to 4 inch pipeline up to the property line or inner edge of the sidewalk, which is sometimes called upper lateral sewer. For the most part, after the property lines, the pipeline becomes 6 inch size after reaching the sidewalk area. Homeowners usually understand that the problems involved to sewer pipes inside the property line are the proprietor’s responsibility to fix, but when it comes to fixing the 6 inch pipeline sewer repair, which is called lower lateral sewer line, some homeowners disagree that they hold the responsibility of hiring a sewer contractor for the sewer repair Los Angeles. This pipe is under the street, will the city do my sewer repair? Isn’t this the cities responsibility to repair my sewer lateral?